Back in March, I reviewed Dr. Praeger's California Veggie Burgers and found them wanting. When I saw the Tex Mex variety for sale, I just had to pick it up. The problem with the other burger was an unpleasant off-flavor that I just couldn't get over. I was hoping that the spicy flavors that are usually associated with the Tex-Mex experience could overcome the problem. So, I fired up my skillet and got ready for another taste of Dr. Praeger's veggie burgers. None of the cooking directions said anything about a skillet, but I went with the BBQ instructions, figuring that was closer than the broiler instructions. (how the heck could you broil this tiny patty for 16-20 minutes and not turn it into charcoal?) I heated it thoroughly and dug in. My very first impression was "ew" but then before I even finished chewing the initial bite, it changed into "huh". I had to give it a second bite, just to make sure. The fact of the matter is, this burger is actually pretty tasty. Aside from the flavor, however, was the texture. The veggies had a good texture, but there was an off-putting mushiness to the patty itself. Whatever is holding together all those vegetables didn't quite work for me. From the ingredients, I'd guess maybe it was the corn meal that was problematic. I think that was what contributed to my initial reaction of "ew" - the mushiness - before the flavor had a chance to kick in. If I were eating a plate of mixed vegetables that had the same seasonings as this patty, I think I could really enjoy it. But the texture of the binder kind of ruined it for me. Sorry, Dr. Praeger - maybe next time. This week, I'm testing out another frozen entree. 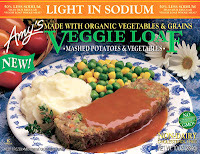 This one is Amy's Light in Sodium Veggie Loaf Whole Meal. I kind of wish the store I'd bought this in had the regular Veggie Loaf meal, for reasons I'll explain later, but this was the one they had, so this was the one I bought. Before I start reviewing the meal, I'd like to make a comment about Amy's website. They have some crazy-detailed info about their foods, which is great. It was also a little confusing for me, since, even after reading the list of (mostly organic) ingredients, I couldn't figure out why this meal didn't get the vegan badge. I dug a little deeper, and discovered that the fact that it contains honey was the reason it didn't get labeled vegan. This led me to a bit of a problem. On this site, I've been labeling things as vegan if they have no dairy and no eggs, but I haven't been checking for honey. Is this a big problem for anybody? I could go back and check, but I don't know how many vegans are really serious about honey. Please advise. In the meantime, I will go ahead and mark this as vegan. In the meantime, let's test out this Veggie Loaf meal. It came with mashed potatoes and some peas and corn. I popped it in the microwave for a few minutes, and got ready to enjoy a mostly-organic veggie loaf experience. First thing I noticed was that the potatoes and the veggie loaf tasted completely bland. I mean, no flavor whatsoever. This is a direct result of the low-sodium claim. Sorry Mom, most food needs at least some salt. I will say, though, that the peas and corn tasted pretty good without extra salt. I don't even really like peas, but these were a very good example of the species. Once I salted the mashed potatoes, I could safely say that these mashed potatoes were probably the best frozen mashed potatoes I've ever tried. 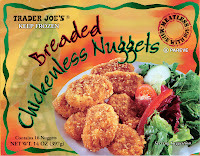 I don't know what they do differently from most other frozen meal companies, but these had a great texture. Well done! The loaf, on the other hand… pretty disappointing. There was a strange creamy texture (lima beans?) mixed with a weird chunky texture and a not-delicious flavor that I couldn't identify (lima beans again? it's been a while…) I tried to like it - the gravy that it came doused in was pretty tasty, but not enough to cover up the weird flavor of the loaf itself. I ended up just eating the potatoes, corn, and peas, leaving half the veggie loaf uneaten. I found it kind of funny that the veggies trying to be meat-like were totally eclipsed by the veggies just being themselves. Maybe that's a lesson most vegetarians already know - fake meat just isn't as good as real vegetables. Flavor - Potatoes: awesome with salt; Corn and peas: awesome; Veggie loaf: blech. Anyone out there a big lima bean fan who can confirm my theory about the lima bean flavor? It's been a while since I reviewed some fake meat chicken nuggets. I'd had good luck so far with fake meat chicken nuggets, probably because real-meat chicken nuggets are so processed anyway, it's not too difficult to imitate the experience. One day, recently, I was feeling lazy, so I baked these up for dinner. We had some awesome homemade barbecue sauce on hand, and so I was feeling pretty optimistic about this experience. They looked pretty normal, as far as frozen nuggets go. The problem started when we actually started eating them. Now, to be fair, they didn't taste bad. But they definitely didn't taste good either. I derived absolutely no pleasure from eating these nuggets. I considered cooking up something else to eat, but I didn't dislike the nuggets enough to motivate me to go back into the kitchen. Even the barbecue sauce wasn't enough to pull these nuggets up to the realm of tastiness. What a bummer! Flavor - nothing to say, really. nothing bad, but nothing good either. It has been a while since I reviewed a fake-meat Italian sausage, so let's take a look at this one. This week, I'm going to take a look at Tofurky Italian Sausage. I was going to use these in an Italian sausage recipe from The Best 30 Minute Recipe, which, if you don't own, you should probably buy. This recipe combined Italian sausage with peppers, onions, and potatoes, with a little olive oil and balsamic vinegar and a few other delicious things. I'm not going to type up the whole recipe, because honestly, it's not that tough. Just cook up some peppers, onions, and potatoes, then add things that sound tasty (okay… tomato paste, garlic, white wine, and oregano) in quantities that seem reasonable. For the sausage in this recipe, however, since it was written for real-meat sausage and I was using fake meat, I changed those directions only slightly. I still sliced them up and browned them in a little olive oil and set them aside before cooking all the rest of the stuff, but then instead of adding them back while the rest of the ingredients were simmering, which would almost certainly result in them overcooking, I just tossed them back in at the very end, and heated them just until they were warm again. The results? Well, I tried a plain piece of the sausage after I browned the slices, just to see what it was like. It wasn't anything spectacular. It wasn't terrible, but it wasn't awesome either. I was hoping that the rest of the ingredients would help pep it up. Once the full meal was cooked, we dug in. It was… okay. We added more salt, which helped a bunch. Season to taste, people! That direction is there for a reason! However, it was still missing something. We came to the conclusion that it was probably missing that meaty and/or sausage-y flavor that wasn't present in the Tofurky sausage. I think if this meal had cooked with some real-meat sausage, or possibly a stronger-flavored Italian fake-meat sausage, this could have been great, but with the weak flavor of the sausage, it just didn't contribute much. Oh, and as for the sun-dried tomatoes and basil that the website claims give these sausages a "wonderful, slightly sweet taste," I'm going to have to disagree. Sorry, Tofurky. This one was not a winner. This week, it's another lunchmeat! We have a foreign exchange student staying with us this school year, and she's really been digging the fake meat lunchmeats for her school lunches (she finished off the Tofurky Hickory Smoked slices that I still had around) and wanted more. 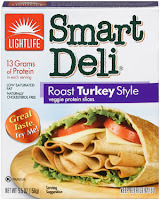 I picked up some Smart Deli Ham and some Smart Deli Turkey recently, and she picked the turkey to dig into first, so I grabbed a slice before she could eat it all so I could review it. Just like the Tofurky Oven Roasted Deli Slices it had kind of a weird flavor. A very similar flavor to the other slices. I wouldn't be terribly surprised to find out one company owned the other or something like that, they were that similar. After the first bite, I really didn't want to eat the rest of the slice, but I wasn't about to throw it out. So I grabbed a cracker, and folded the deli slice onto it. Even with two layers of fake meat, the flavor of the cracker completely drowned out the flavor of the fake turkey. It tasted like absolutely nothing, just like the Tofurky brand. So I don't really know what else to say about these. Not a great flavor on its own, invisible when combined with other stuff. When it comes to fake lunch meats, this was not terribly exciting. Texture - Standard lunchmeat experience here. Nothing notable to report. Flavor - Not great alone, no flavor to speak of when combined with other elements.